SA trounced NZ in a professional chase, but the highlight was the last over from Bond. Bond, steaming in at express pace, trying to salvage a win and stay alive in the series, with 9 required off the last 6, bowled a near length ball to Kemp, whose mighty swing landed the ball well outside the stadium. 3 required off 5. A short ball, duly deposited through square leg — one bounce and over the ropes. The End. SA 3-0 up in this 5 match series. Match page. A very heartening performance. When you put a team on the mat, you must keep them right there and that’s what we did today. Everyone chipped in their bit and 122 was never going to be remotely challenging on this turf. With this, (and WCC 2003), we’ve all but nearly wiped off that embarrassment of 54 all out against SL, though 7-0 in this series would probably do the job! It is really nice to see guys like JP Yadav do their bit in such good fashion… a nice medium pacer is very useful, particularly on stoppy and seaming tracks. Good job, JPY! As for the batting, Sehwag and Sachin threatened to finish as much of the match as possible before lunch, and almost achieved their end. With 2/3rds of the total wiped out by lunch, SL had little to play for when they came out, with only Murali tossing up a real fantastic over, when even the great Sachin had little clue to what was coming up next. That apart, the feature of the innings was the Sehwag hook and cut, for six and a one-bounce four, that left Vaas wondering where to bowl. To drive the nails deeper into the Lankan coffin, Sachin swept drove and punched Vaas for boundary after boundary. In the end, a comfortable win. For those who wonder why Sachin was 67* and not 70*, the rule is that once the winning run is completed, in terms of the batsmen crossing over, before the ball reaches the boundary, the match is complete. The ball is possibly no longer in play and only the single adds to the scores. I wonder, what if the ball is instead caught! Supersub supergoof: I wonder why India took Sreesanth as the supersub – I wonder if it was a tactical blunder. That it did not matter today is a different issue, but you don’t commit such basic blunders. I wonder if there is some confusion with toss and supersub selection: but I guess you carry two teams in your pockets – so unless Dravid handed over the sheet from the wrong pocket, I think there’s no room for a wrong supersub! 1-0: Sachin returns; India return? With Dravid taking on the reins more seriously, rather than just a stop-gap replacement for Ganguly, it will be very interesting to note the rest of the series. But as I have always maintained, it’s Sachin’s presence in the team that’s been missing for too long, that too in crucial times. He can be in the team, not score (okay, not take a five-for as well) and still inspire. Even for a die-hard and numero uno fan of Sachin, this comeback – at least game one – has been a fairy tale. Let’s hope he carries on. But it wasn’t a total surprise, after seeing his six boundaries in the Challenger trophy final. Good job guys. But we need to be thoroughly professional. Nothing less than a 5-2 or a 6-1 can serve to prove that point. A word of caution: Let’s not be blinded by our love for Dravid that we appreciate everything he does. He really did nothing new. Even Agarkar has been sent at #3 (he scored 95 against WI). Every captain, other than the dumb Attapatu would not take the powerplay when the opponents are blazing. Every intelligent captain would take it again at the fall of an important wicket. That’s all fine. Yet, we must appreciate the way he handled Sreesanth and Kartik. I’ll hope this is not a lone good performance from Kartik and he will improve. Come on, India, get on. Ganguly, come on now. It’s a nice time to re-enter the team… Imagine Chandana and Dilshan disappearing into the roads, rather than the stands! Dada, roar! This article on rediff today, does make one proud of the research in the country. Once again, goes to show that great people can do great work anywhere. In one more example of the world’s discovery of India as the place for cutting edge technology development, most of the designs for building Boeing’s next generation aircraft are going to be created and tested by the Indian Institute of Science, Bangalore. IISc, India’s premier scientific research institute, has joined hands with Boeing, the leading American manufacturer of satellites, commercial jetliners, and military aircraft, to build next generation aircraft. Nearly 40 faculty members from various IISc departments — like aerospace, metallurgy, centre for product design and manufacturing and civil engineering — are involved in the Boeing project, which is being managed by the Society for Innovation and Development. SID is IISc’s commercial arm, which was founded more than a decade ago. SID undertakes research and development projects based on individual or joint proposals from IISc faculty and scientists, in collaboration with national and international organisations and business houses. 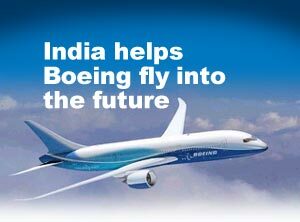 SID Chief Executive S Mohan said Boeing signed a memorandum of understanding with the Institute earlier this year. Boeing’s other global partners in research include Carnegie Mellon, Stanford Engineering, Massachusetts Institute of Technology, Caltech, University of Illinois at Urbana Champaign and University of Cambridge. The IISc-Boeing tie-up says the aerospace major would invest $50,00,000 in research every year for the next five years in the company’s projects with the Institute. “We have identified nine projects in which we will work with Boeing to build next generation aircraft,” Mohan said. To build these new planes, the IISc team has proposed the use of smart structures and the application of lightweight components like nano materials, alloys and their composites. IISc’s areas of focus include developing flaps for the aircraft that are fitted with smart sensors — so that they can direct wind currents better — and use of aluminium alloys in high temperature areas as well as in landing gear boxes. The designs will be tested in a virtual environment being developed at the Institute. “The Boeing project involves lots of innovative research. It is going to be interesting and very challenging,” a researcher involved with the project said. SID will enable innovations in science and technology by helping industries and business establishments compete and prosper in the face of global competition, turbulent market conditions and fast moving technologies, Mohan said. The Boeing project is one of SID’s many ongoing ones. IISc launched SID with just one project in the year 1994, and a total financial outlay of Rs 2,25,000. Till date, SID has generated approximately Rs 600 million worth of research projects.